Are you eagerly anticipating your vacation to the Last Frontier but curious how you’re going to see they very best of all 663,300 square miles of Alaska splendor? The National Register of Historic Places is the National Park Service’s listing of the most historic places in the United States that require preservation. In Alaska, there are approximately 400 sites listed. Experience Alaska’s past, present and future with the National Register of Historic Places and Princess Lodges. 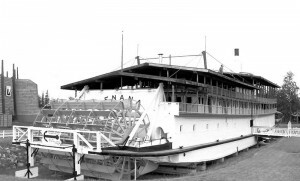 S.S. Nenana Paddlewheel boat courtesy of Wikipedia. While you’re in Fairbanks, make sure to stop by Pioneer Park – Alaska’s only historic theme park. The S.S. Nenana, added to the National Register of Historic Places in 1989, is one of the featured attractions at the park. The river paddlewheel steamboat is the largest ever built west of the Mississippi and was commissioned by the Alaska Railroad to transport passengers and freight on the Lower Yukon River. The historic Wickersham House is also a featured attraction at Pioneer Park. Built in 1904, this house was the first home in Fairbanks built with milled lumber and a white picket fence. The house was partially restored by the City of Fairbanks in 1977 and officially declared a landmark in April 1979. Before you depart Pioneer Park, retrace the footsteps of President Warren G. Harding and as you visit the Harding Railroad Car, one of the most symbolic landmarks on the register. The 29th president rode in the railcar when he visited Alaska in 1923 to drive the golden spike into the rail, commemorating the completion of the Alaska Railroad. The railcar has been since restored and was placed on the register in 1978. 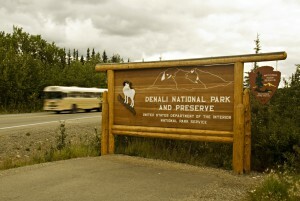 Denali National Park and Preserve is full of modern action, rustic wilderness and adventurous activity. The park also has an impressive 16 destinations on the National Register of Historic Places. A majority of the landmarks are ranger cabins that are used as shelters to provide respite during harsh weather. Visitors can choose from a variety of bus tours to explore the park in its full glory. Explore history-laden Talkeetna en route from Anchorage to the McKinley Princess Wilderness Lodge. Talkeetna is an unincorporated town with an unofficial mayor named Stubbs, who is a cat. We kid you not! The town also serves as a base for most Mount McKinley expeditions. There are many scenic viewpoints throughout the town where fortunate visitors can witness spectacular views of the largest mountain in North America. It may not have officially made the register, but it is worth a stop, to be sure! For more information about other spots on the National Historic Registry, visit the website. Don’t forget that our rail tours and packages visit many of these locations, and our sister company, Westmark Hotels also offer a great place to stay when touring the 49th state! Allow Princess Lodges to guide you through Alaska’s fascinating past and create your own memories to rival those of the original pioneers. Check out Princess Lodge deals and specials to experience world-class adventures on a small-scale budget.